In my recent reading of the Tang dynasty history, which was was initially compiled in 945 and revised in 1060,2 I realized that his stated view accords with what we see in the classical Chinese history. With respect to whether this is a plausible explanation for Tibetan ethnogenesis, several of the individuals mentioned in the history do appear in earlier histories as significant leaders, which lends some credibility to the story, however I am not in a position to make any conclusions. It is nevertheless valuable to have a classical Chinese perspective on the origins of the Tibetan people. The detailed history of Tibetan affairs begins in year 634 with the first contact between the Chinese court and Songtsen Gampo, to whom the Zhang Zhung and various Qiang peoples submitted to. This perhaps tentatively marks the beginning of the Yarlung empire. From here there are detailed accounts of interactions with Tibet, both peaceful and otherwise. 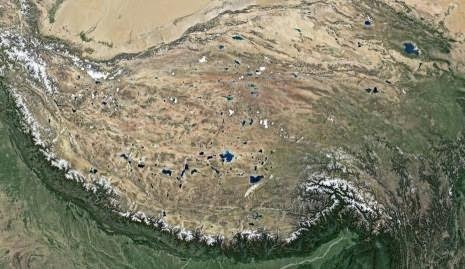 The Tibetan history comprises two whole scrolls in the Old Book of Tang, which is comparatively long, but reveals how significant a neighbor Tibet was to the Tang empire. There are also two scrolls dedicated to the Western Turks, who were another enduring foe to the Chinese in this period. The following is from scroll 196a of the Old Book of Tang (舊唐書卷196上). Tibet is 8000 li west of Chang'an. It was originally in the Han [206 BCE - 220 CE] the land of the Western Qiang people. It is unknown where their tribe came from. Some say they are decedents of Tufa Lilugu 禿發利鹿孤 of the Southern Liang [397-414]. Lilugu had a son named Fanni 樊尼. When Lilugu died, Fannni was still young. His younger brother Nutan 傉檀 ascended the throne. Fannni was made general of Anxi. In year 1 of reign era Shenrui 神瑞  during the Later Wei [386-534], Nutan was destroyed by Qifo Chi Pan 乞佛熾盤 of the Western Qin [385-431]. Fannni summoned together the remaining masses to join with Juqu Mengxun 沮渠蒙遜. Mengxun made him the governor of Linsong. When Mengxun died, Fannni quickly led his masses west. They crossed the Yellow River and went beyond Mt. Jishi. They founded a country in Qiang and opened up 1000 li of land. Fanni was imposing and benevolent. He was cherished by the Qiang tribes. All were treated with grace and trust. They gathered to him as if being in a market. He then changed his family name to Suboye 窣勃野 and named the country Tufa. As a dialect variant it was called Tubo. His descendents flourished. They further ceaselessly invaded other countries and their realm gradually expanded. Through the Northern Zhou [557-581] and Sui [581-618] dynasties, they had no contact with China as they were still separated by the Qiang tribes. In year 8 of reign era Zhenguan , their Tsenpo Trisong Songtsen [Gampo; bTsan-po Khri-srong Srong-btsan] first dispatched envoys to pay tribute at court. 1 Michael L. Walter, Buddhism and Empire The Political and Religious Culture of Early Tibet (Leiden, The Netherlands: Brill, 2009), 23. 2 These are respectively the Old Book of Tang (Chn. Jiu Tang Shu 舊唐書) and New Book of Tang (Chn. Xin Tang Shu 新唐書). ...Thirteen years of age he ascended the throne and, brought under his power all the petty chiefs of the borderland who offered him presents and sent their messages (of submission). See The History of Tibet Volume I The Early Period: to c. AD 850 The Yarlung Dynasty, edited by Alex McKay (London, UK: RoutledgeCurzon, 2003), 338.